Cat Chat With Caren And Cody: "Cat bed? I'll sleep where I want, thank you!" "Cat bed? I'll sleep where I want, thank you!" MOL Cody! I sleeps wherever I wants too. Yes, I see Cody, and I think that is an AWESOME bed! That is the perfect bed, high up and comfy. My cats usually end up in our dog beds. Way to go, Cody! All comfy. That spot looks purrfect to me Cody! Oh I love where your kitty is sleeping while “lending” her bed to Cody! Yes, I see Cody and he's right...he'll sleep anywhere he wants. Too cute. I linked this post to Awww Mondays. 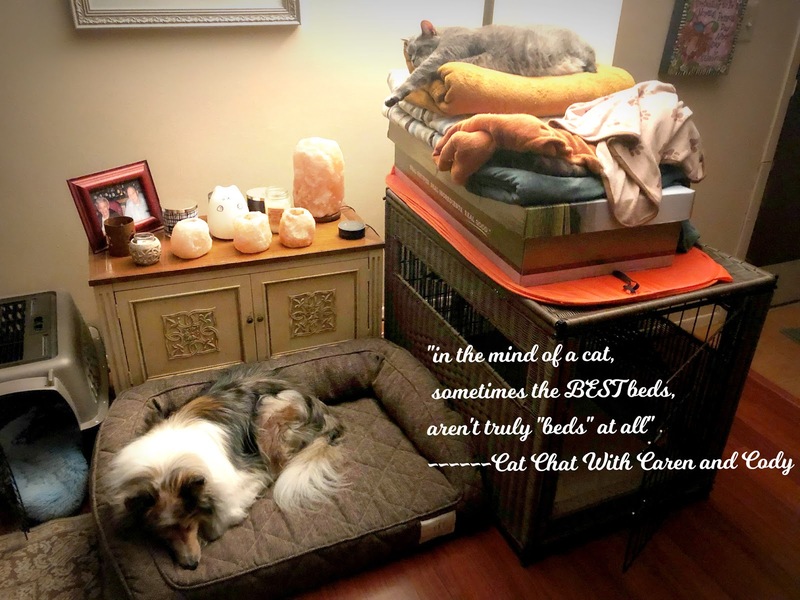 Love your doggie and kitty photo ~ and yes cats sleep most anywhere and enjoy it! Yep, everywhere looks like a bed to us! MOL! We've posted your link on our blog entry today on winning your Cat Poetry book contest a few weeks ago. Thank you again for holding it. We love that book so much! One can never figure out what a cat is thinking! I remember when I first introduced a cat/dog bed to my cats Tigger and Daisy Mae. They went over sniffed and were terrified of the bed. Daisy Mae sleeps where she wants and Tigger passed over the Rainbow Bridge almost 3 years ago now. Me too Cody...mom says I'm like a 500 lb gorilla...I sleep where ever I please. A pile of blankets is a perfect bed. So true! The only time my cats sleep in the "right" bed is when I put them in front of the fire! We think you found a really comfy spot, Cody! Just don’t roll over! The ideal bed. A raised bed for royal Cody. We were so focused on Dakota we almost missed him. my husband was the same as you! You found the perfect place Cody. We don't need cat's bed. Every places are our bed. Best to be high up, Cody! Sometimes the chosen sleeping spots do not really look all that comfortable either. I guess it is all about location location location! Cody, that is our favorite kind of cat bed! It is a cat's prerogative! Dakota's lucky you didn't decide to commandeer HIS bed! Cody really seems to be enjoying his "bed"! Well, that looks like the perfect spot, Cody! Just don't roll over and fall off! We agree with you 100%. We have two cat beds that are so comfy that I wish I could lay in it. Our littles ones at home are on top of the couch and on the edge. Looks like they are barely hanging on and they are in dream land. Cody, I guess you got top bunk. Thanks for the share. Have a great day. The best beds are always on human's stuff. "Where we lay, it's bed"
he looks like the princess er prince and the pea! That looks like quite the cozy spot, Cody!! You sure found the bestest place!